Alan Crawford, also known as Scipio, is a character in the Grand Theft Auto series appearing as a minor character in Grand Theft Auto: San Andreas (set in 1992). His voice artist is not credited. Alan Crawford, at an unknown time, became involved in music management and became the manager of the successful rapper Madd Dogg, helping him on his way to success. A jealous Jeffrey "OG Loc" Cross, an aspiring rapper, hires Carl Johnson to kidnap and then kill Crawford in an attempt to sabotage Madd Dogg's career. Johnson steals the limousine scheduled to pick Crawford up and then, after an awards ceremony, drives the car into the nearby bay, bailing out just before the car enters the water. The death of Crawford sees Madd Dogg slowly turn to drugs and, as a consequence, becomes extremely depressed and attempts to kill himself after losing his mansion to Big Poppa of the Los Santos Vagos. Ironically, Carl Johnson ultimately replaces Scipio as Madd Dogg's manager. Crawford claims to know Ballas OGs, saying that they are 'like brothers'. 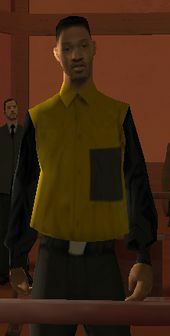 His character model appears on the poster for The Mainframe in Grand Theft Auto: Liberty City Stories. He has the same character model as a pedestrian. In addition, the character model looks strikingly similar to American rapper and actor Will Smith. His outfit is based on that of Tre Styles on the front cover of the film Boyz n' The Hood. This page was last modified on 27 February 2014, at 08:41.